The helmet features “Ed” along the side and a small inscription of “Father and Son”. What it doesn’t include are the colors of Flemke’s current car – or the #79 ride that he drove last season, when the idea for the design came about. Flemke has one upped his father in one small way. The original helmet that Flemke’s father wore had gold leaf paint and new one has real platinum flakes in the paint. The best thing about the new helmet though is what it means to Flemke. It may or may not rain this weekend, but either way there won’t be any racing at Unity Raceway. The track has called off their opening day program early because of soft ground conditions. It’s mud season in Maine because of melting snow and April showers, so a move like this is not unheard of. And of course, Tomaino wants to run well at the tight quarter mile, where beating the locals is quite a challenge. 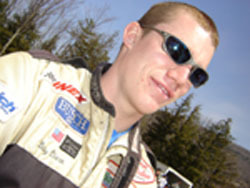 NASCAR Whelen Modified Tour driver Eddie Flemke celebrated his 50th birthday on the day of the Spring Sizzler. The occasion was perfect for him to receive a very prized gift – a helmet present to him by the brothers Brian, Eric and Gary Williams – a trio of long time Flemke fans. “I’ve got my new helmet,” Flemke beamed on Sunday. And the story behind that helmet is quite an interesting one. It goes back a few decades in fact and includes Eddie Flemke, Sr., one of the most noted Modified racers in history. The reason for the hand me down suit is purely an economic one. Meanwhile, Oxford Plains Speedway (ME) is all ready to go with their opening race weekend. Saturday night’s racing card will include the track’s first PASS Pro Stock (Super Late Model) event in a few years. It will be the first of two such shows in 2005. Drivers who are entered include all of the PASS and Oxford regulars, as well as NASCAR Modified Tour driver Ted Christopher and NASCAR Busch North drivers Ryan Moore and Billy Penfold. Speed51.com will be at Oxford and will have full coverage of the event. 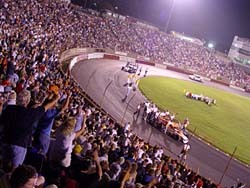 When Bowman Gray Stadium (NC) opens its doors on their 2005 season this Saturday night, there will be at least one invader in the crowd from the NASCAR Whelen Modified Tour. Jamie Tomaino will drive a team car to Brian Pack in the race. Tomaino is looking forward to a little time south of the Mason Dixon Line, he has towed his own car to a few events this year on the Whelen Southern Modified Tour, but hasn’t seen Bowman Gray in quite some time. Continuing with the father and son fashion theme of this week’s column, let’s now take a close look at PASS driver Cassius Clark’s driving suit. When Speed51.com was recently talking with Clark, we noticed that the name on the top pocket is actually that of Billy Clark – Cassius’ Dad. 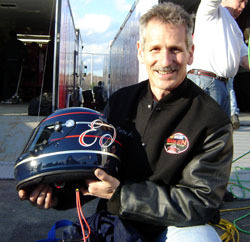 “The Farmington Flyer” is now retired from racing, but was a notable Oxford Plains Speedway and NASCAR Busch North Series regular in the 1980’s and early 1990’s. Flemke lost contact with them until some time later. Eddie Flemke has a cool, new helmet.